We are a family of seven. However, we recently welcomed a family of six to come and live with us for as long as they need a place to stay. It might be a few weeks. It could be several months. So, our total “family” size right now is 13! Adjusting to having 13 people under one roof has actually been a lot easier than you’d think. In preparation for our new additions, we decluttered rooms, threw a few mattresses on the floors, and doubled up in a few bedrooms, but we all seem to fit just fine. So, space has not really been the biggest deal. The real adjustment has been in the area of feeding people. We have one extra adult, three new teens, one preteen, and one more elementary age eater to feed in our home. This also means that I have several new taste buds to try to appeal to as I plan out our meals. So, if my Trader Joe “friends” thought I looked crazy as I walked out of the store with 2 carts and 6 gallons of milk before we added to our family…wait until they notice how much more food we are buying now. So, how am I pulling off feeding everyone and not breaking the bank? Meal planning! Here’s the thing…nothing has really changed that dramatically in the way I’m meal planning. I still print out my planner and plan out my meals for the week. I’m mostly just doubling my recipes. The great part has been having so many new sous-chefs in the house. There are just too many people in our home to wing it. Now, I love winging it and I always have easy, back-up plans for meals. However, there are just too many teen bellies to keep fed and happy right now. Meal planning doesn’t have to be overly complicated — no matter how many you are feeding in your home. We love entertaining, so I’m used to shopping and cooking for large groups. However, it is a different story when you have people staying with you for more than just a days. I have an “Easy Meals” List. This is my “secret sauce” to easy meal planning. I keep a list of all the recipes I have that are really easy to make. I have my crockpot recipes on here along with a list of meals that I don’t need a “recipe” for like tacos, burgers, and BBQ chicken. I also list out meals that I can buy pre-made. We love frozen lasagna and orange chicken. So, those things are on the list, too. The key is to have all these meals listed out in one spot as a point of reference. I still have my favorite recipe books and recipe boxes that I pull recipes from time-to-time. But the bulk of what I make each week, especially while we have long term guests, is from my “Easy Meals” list. I actually keep my list and all the recipes in a little white binder. So all I have to do is pull it out and pick the meals for the week. Dishes, laundry, and basic housekeeping is keeping us busy these days. But as my mom always told me (and her mom told her), “Many hands make for light work.” So, we have everyone pitching in around here. 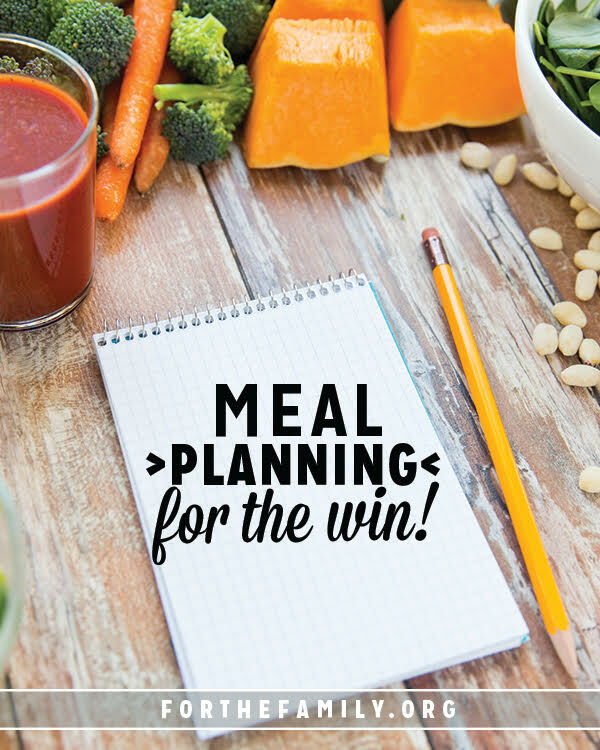 But when it comes to what we are eating each day, some easy meal planning has been a real “win” for our families. P.S. If you’d like a free copy of my Sanity Savers for Moms eBook (which comes with my meal planner), you can get a copy here. I hope it blesses you! What is your best “secret” to easy meal planning? Any chance you will share your easy meals list ? Especially your crock pot meals? I am not much of a cook. I am overwhelmed picking recipes online because most of the reviews say “5 stars -I’m going to try this”! Or 5 stars but I changed this and substituted this… Etc. I Would love to get some tried and true easy meals to start my own meal planning binder!! !